I am sure that, by now, the majority of you have heard of the newest business for families to open in Durham. It was highly anticipated (because the idea is brilliant) and opened this Saturday with much fanfare. Good news - the place meets all expectations. 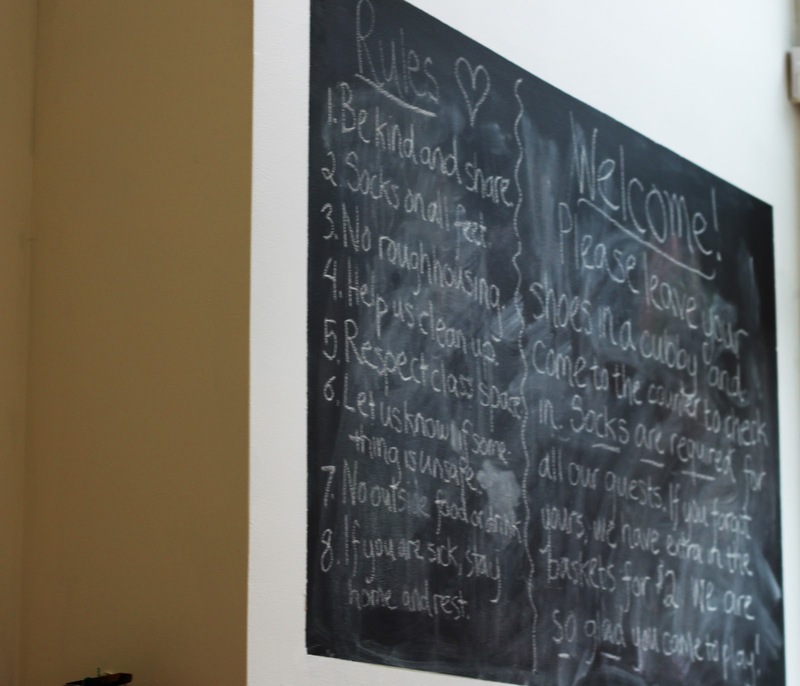 Stay & Play Snack Cafe is a coffee house in downtown Durham that is for families to come play. One big, long room is filled with toys, padded floors, and creativity so that parents can sit, have a cup of coffee or latte and a muffin from Ninth Street bakery, kids can get some popcorn from Mad Popper when they get hungry (or other snacks), and kids can play. FINALLY - we now have a place where we can have coffee with a friend and avoid hipsters on their computers throwing us judgemental looks because our children are running around making loud noises (or is that just me?). Stay & Play has an area for art with supplies provided by Bull City Craft, a train table, a play kitchen and dolls, a padded area with a climber and large blocks, books, a bunch of small tactile toys stored and labelled to bring out and play with, and an area for infants in the back. Much of the toys gear towards kids under 6 or so but kids of any age are welcome - just have the older kids bring Angry Birds on their iPads or whatever it is they do nowadays (Lord, I hope you all help me when I have older kids). Surrounding all this kid-joy are chairs and tables and sofas for parents and caretakers to sit on (although let's be honest, we still don't get to sit much). There are all kinds of events going on, too. There are art times (for a small additional fee for supplies), storytimes (no extra charge), and Stay & Play has invited some of our favorites - Healthy Moms and My SweetArts - to come in and offer classes (these classes cost additional money). I love that Emily, the owner of Stay & Play, has thought of everything. In the bathroom, for example, in addition to a changing table there is step stool for the sink, a step stool for the toilet, a toddler potty seat, free breastpads, and more. All over the cafe there are antibacterial wipes hanging in beautiful canisters. Prices are reasonable across the board. Snacks for kids come in cute little muffin cups and are $1 per cup. You do have to pay to play and stay here (unless you are taking one of the fee-based classes). Adults are free (I think because we end up drinking a lot of coffee so we more than make up for it) and the first child is $4.50, each additional child is $3.00. I thought this was worth it. You can buy membership at a variety of levels, too, which would be worth doing if you know you will frequent this spot. You must wear socks to play and everyone has to leave their shoes off at the door (yes, even adults so make sure you wear your socks without holes in the toes). Also, you can't take strollers back in to the cafe (you won't need them) so unless you are doing some heavy duty walking to get there you can leave the stroller in the car. Our group ended up heading over to Bull City Brewery for some burgers afterwards but this isn't too far from some of our other Durham favorites either. There is street parking available if you want to search but you can also park across the street in the garage ($1/hr weekdays, free on weekends). Truly, my only complaint about this new business model that has come to the Triangle is that no one has opened one in Chapel Hill. I feel like Stay & Play Snack Cafe meets a need that has existed for a long time in a elegant and desireable way.